Joseph Enriquez (second from left) holds his trophy and prize as he poses with (from left) organizing committee chairman John Jay Omega, runner-up Marc Enriquez and Ormoc Tennis Club president Benjamin Omega after ruling the men’s Open singles in the first PPS-PEPP Goma Cup Open Tennis Championship. Fourth-ranked Joseph Enriquez outduelled sibling Marc with his power and superb baseline game, scoring a 6-4, 6-2 romp in the finals to become the first PPS-PEPP Hon. Richard Gomez Open Tennis Championship champion at Ormoc Midtown Tennis Courts in Leyte recently. Enriquez, 20, flashed top form in the first three rounds, dropping just five games then thwarted Venz Alforque, 6-3, 6-3, in the semis before prevailing in long rallies and subduing his elder brother to pocket the top P20,000 purse in the men’s singles Open put up by Gomez as part of his effort and commitment to boost local sports and sponsored by Palawan Pawnshop-Palawan Express Pera Padala and presented by Dunlop. The Univ. 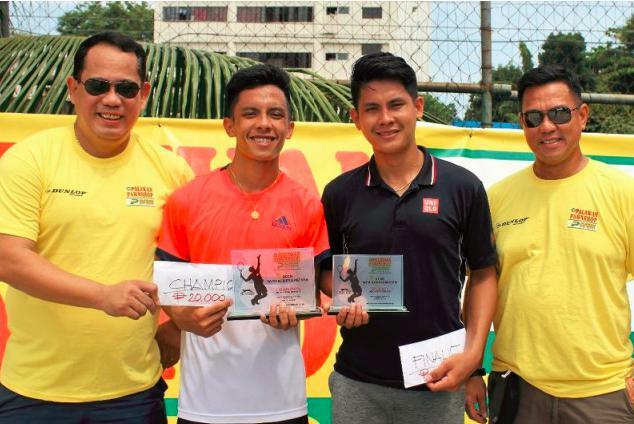 of Visayas student actually came into the event brimming with confidence following his three-gold romp in the recent Philippine National Games where he took the singles, doubles (with Marc) and mixed doubles (with Zethley Alferez of Naga City) titles. His Goma Cup triumph also netted him a wild card slot, plus free airfare and hotel accommodation in three other PPS-PEPP Open tournaments, including the Ibalong Open in Legazpi City, Albay, the Pintaflores Festival in San Carlos City and the Iloilo Open. “We thank Mayor Gomez and the organizing committee for joining our ever-growing list of age-groupers and Open championships nationwide. This guarantees a steady flow of talents, which we hope to nurture through our weekly tournaments,” said Palawan Pawnshop president Bobby Castro. On their way to the semis of the event, backed by Asiatraders Corp. and sanctioned by the Unified Tennis Philippines, made up of PPS-PEPP, Cebuana Lhuillier, Wilson, Toby’s, Dunlop, Slazenger and B-Meg, Joseph toppled Ju Rhee Young, 4-2, 4-0; crushed Tyrone Ybañez, 4-0, 4-0; and dominated Sai Lago, 6-1, 6 -2; while Marc scored a walkover win in the first round, routed Nicolas Olat, 4-0, 4-0; then pulled off a pair of tiebreaks, 6-2, 4-6, 10-7 over Vinz Lominoque and 6-4, 6-7(6); 10-7, over third seed Ricardo Lagac.